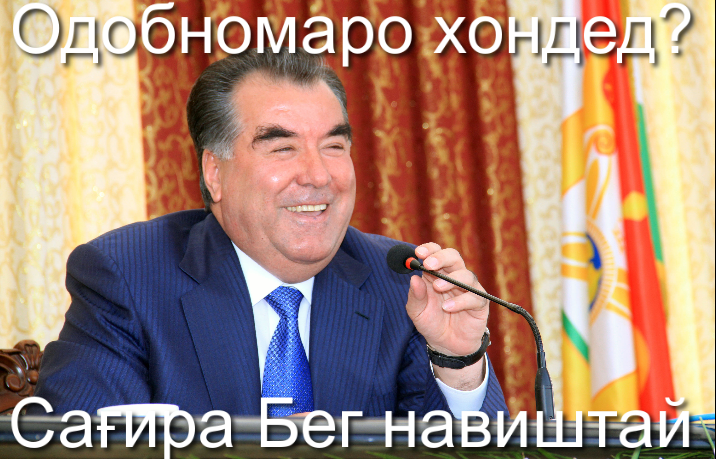 This image portrays smiling Tajik President as saying, “Have you read the Ethical Code? It was written by Beg [Zukhurov]“. Image from Digital Tajikistan blog, used with permission. Hae-in Lim, Alex Laverty, Juan Arellano, Hisham Almiraat, Weiping Li, Lisa Ferguson, Ellery Biddle, and Sarah Myers contributed to this report. Global Voices Advocacy's Netizen Report offers an international snapshot of challenges, victories, and emerging trends in Internet rights around the world. This week's report begins in Tajikistan, where a new “Ethics Code for an e-Citizen” was released on Oct. 11. Developed by the executive branch, the state telecommunications authority, telco industry associations, and a handful of NGOs, the code covers personal data protection and human rights (+1) but also includes a mandate that “positive thinking, positive communication, and positive action should prevail in virtual space.” It also forbids talking loudly on cell phones in public areas, playing loud music, and using “unpleasant sounds” online. Authorities say the code is not a law but rather a guiding tool for ICT users. Tajik Twitter users nevertheless suspect the government will use the code to stifle online speech. The Chinese 50 Cent Party of government-paid social media commenters is being professionalized by the Chinese government. The Ministry of Human Resources and Social Security has given the title “Internet Opinion Analyst” an official status, enabling the government to hire for these positions under their regular budgets rather than squeezing them in secretly. Two Ethiopian journalists are serving jail sentences of 18 months and five years, respectively, under the country’s Anti-Terrorism Proclamation. Though still in prison, the journalists are now challenging the law by applying to a Pan-African court that has the power to issue a binding ruling against the Anti-Terrorism Proclamation of 2009, which facilitated the closure of all independent publications in the country. The European Court of Human Rights ruled that online portals are fully responsible for the comments posted under stories. In the case Delfi AS v. Estonia, the court found news site Delfi.ee, responsible for threatening posts made to a ferry operator and its owner in the comments thread of a story. According to Index on Censorship, the ruling is not yet final and is subject to further review. The latest Snowden leak does not bode well for US-Mexico relations. Not only did the NSA hack into and spy on President Peña Nieto’s email during the 2012 election season—the US surveillance agency also managed to sneak into the private communications of former president Felipe Calderón, who had been an extremely cooperative American ally. The NSA reportedly gained access to the e-mail accounts of Calderón and other high-level officials, and has been spying on President Peña Nieto since early in his candidacy for office. Ecuador passed a new version of its penal code that criminalizes various online activities, including slander on social media networks. The code could also leave institutional WiFi providers (Internet cafes and libraries, among others) responsible for collecting and storing user data in order to serve government interests—it even includes a provision requiring that Internet cafes install security cameras to surveil monitor their customers. In Morocco, where users are not happy about the arrest of journalist Ali Anouzla and subsequent ISP filtering not only of Anouzla’s online publication Lakome, which was blocked on October 19. Reflets.info, an independent hacker media outlet based in France, has also been blocked. Anouzla is being charged with terrorism for writing an article about a YouTube video allegedly made by al-Qaida in the Islamic Maghreb that disparaged the Moroccan king and called the country a “kingdom of corruption and despotism.” Although the authorities’ response to Anouzla’s work is nothing new, the Electronic Frontier Foundation notes that in the past Moroccan authorities have responded to outside pressure to uphold human rights. Reporters Without Borders expressed concern about the disappearance of Kenyan journalist Dickson Bogonko Bosire, who is the editor of Jackal News, an online publication that covers corruption and malfeasance. He has been missing since September Sept. 18, 2013. Due to the nature of his blog, he has received threats and has had to go into hiding several times before. Peru’s IT Crimes Act, approved by Congress in September, was signed into law by President Ollanta Humala yesterday, despite robust civil society efforts [link in Spanish] to halt the legislation. Although a public version of the text of the law had endured thorough scrutiny from civil society and substantial revisions over time, the version that ultimately passed was prepared by a small committee in the final hours before the vote, giving the public no opportunity to review or respond to the text. The law contains provisions on crimes “affect[ing] computer systems and data” written so vaguely that they could be applied to perfectly legal activities. The Mail.ru group, Russia’s leading webmail service, was fined 50,000 rubles (approximately US$15,000) by the Bank of Russia for refusing to comply with user data requests. The bBank requested information about users’ correspondence and whom they were in contact with over a set period. Anton Malginov, the head of Mail.ru Group’s legal service, said they had no right to disclose any user correspondence without a court order. They plan to contest the fine in court. Freedom of Information Act requests sent to the US the Department of Defense are coming back undeliverable because of a faulty fax machine that may not be fixed until November. Despite the massive defense budget, the Office isn’t exactly in step with the latest technology, requiring FOIA requests to be sent in by fax, mail, or a clunky online request portal. Kenyan President Uhuru Kenyatta announced plans to set up a website for citizens to report cases of corruption within the government. In a speech before the Women and Youth Expo, he told government officials, “We have reached a point where if you want to keep your Ggovernment job, you must be satisfied with the salary you are paid.”. The second annual Arab Internet Governance Forum [link in arArabic], held in Algiers, was marked by the absence of local representation from Algerian civil society, particularly young people. According to Tunisian human rights activist Wafa Ben Hassine, who attended the Fforum, at times the conference “was emblematic of the very issues it aimed to address” and needed greater interactivity. A new survey [PDF] by Afrobarometer of 51,000 people in 34 African countries found that while 84 percent use mobile phones usage had reached 84%, only 18 percent % of the population used the Internet. OAfrica noted that radio remains the dominant medium for news outside of North Africa.